The official launch of Appalachian Air occurred earlier this week in eastern Kentucky. 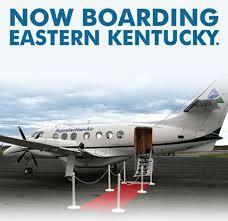 Officials are hopeful new daily commercial air travel between Pikeville and Nashville will allow for new economic development in the region. Luke Schmidt is a Project Consultant for Pikeville Air. "It will now become easier for people who want to travel to Pikeville and eastern Kentucky from other business centers around the country, including people who might be representing companies that are interested in investing in the region, maybe building a factory, creating new jobs," said Schmidt. Schmidt says present day economic development is all about access and travelling from corporate headquarters to remote operations. Schmidt says a person travelling from Pikeville could make it to Los Angeles before noon Pacific Time. "You can get on the plane at Pikeville at 6:30 in the morning, arrive in Nashville about 7:00 a.m. with the time change and Central Time. And then you can connect with 50 some odd cities from Nashville," added Schmidt.